Brazilian prosecutors have opened a preliminary investigation into former President Luiz Inacio Lula da Silva over alleged influence peddling. The federal prosecutors' office has confirmed reports that Lula is being questioned over claims that he helped leading construction firm Odebrecht win contracts abroad between 2011 and 2014. They now have 90 days to decide whether to launch a full inquiry. Lula and Odebrecht have denied any wrongdoing. Brazil's Epoca magazine reported on Friday that Lula had allegedly persuaded foreign leaders to give inflated contracts to Odebrecht. It also claimed that the former president had helped the company obtain low-interest loans from Brazilian state development bank BNDES. According to Epoca, Odebrecht paid Lula to travel to countries including Cuba, Ghana, Venezuela and the Dominican Republic to help secure the deals. 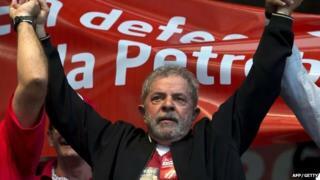 Paulo Okamotto, head of the Lula Institute, said in a statement that the former leader rejected all the allegations. On Monday, the Sao Paulo-based institute admitted that a "preliminary procedure" was under way, but said it was not yet a formal investigation and that the inquiry may "simply be archived". Odebrecht has said that its relationship with the former president was "institutional" and that Lula had never acted in a lobbying role for the firm. News of the preliminary investigation comes at a difficult moment for Lula's successor, President Dilma Rousseff. She has faced street protests, impeachment calls and plummeting opinion ratings after a corruption scandal at state-controlled oil company Petrobras. Ms Rousseff has not been implicated in the scandal but more than 40 politicians, including the heads of both houses of congress, are being investigated. In April, the treasurer of Brazil's ruling Workers' Party (PT) Joao Vaccari stepped down after being arrested over the alleged corruption scheme, in which it is claimed that the party received dirty money from inflated deals between oil executives and construction firms. Lula, who founded the PT and served as president from 2003 to 2010, remains popular in Brazil.